Aadhaar card was launched as a program with the main objective being the dispersal of a universal identity for every resident of India. Since the initiation of this program, having an Aadhaar card has become mandatory given the fact that it is being accepted all over the country for identification purpose which was earlier limited to a driving license or voter's id. The process to apply for aadhaar card is fairly easy. 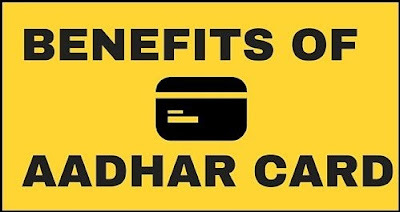 Considering the fact that it has been mandated by the government of India, here are some of the major benefits of having an aadhaar card. This identification digit with twelve digits can be used for the transfer of the LPG subsidy directly to your bank account. This scheme has been named "PAHAL". In order to get the benefit, you have to visit the local distributor for LPG and get your consumer number linked with your aadhaar. If you don't have an aadhaar card, get one fast and link it to your consumer number. You can check the progress of your aadhar card by name in the official website of UIDAI. The Pradhan Mantri Jan Dhan Yojana requires one to show just the aadhaar card for creating a valid bank account. You can create your bank account with other documents as well, but aadhaar card serves as one key for all. With an aadhaar card to represent your identity, you can get your passport delivered to you just within 10 days. This format requires police verification to be done later. Indian government has brought along the digital locker for the residents to store any kind of personal information in the server secured by the government. To do this, you need to link your aadhaar with the same and get the benefits of the digital locker. In order to eliminate frauds, the government has mandated the inclusion and linking of aadhaar to your voter id. All pensioners who require monthly pension after retirement need to link their aadhaar number in respective departments to initiate the process. Similar to the pension scheme, the PF shall only be provided to account holder with a registered aadhaar number linked with the bank and EPFO (Employee Provident Fund Organization). The UIDAI provided aadhaar card, now works as an acceptable identity at all the banks in India. It serves as both an identity proof as well as address proof. The Digital Life Certificate or Jeevan Praman for Pensioners was initiated in order to curb the need for pensioners to be present physically at the Pension Disbursing Agency. All you need to do is link your aadhaar card to enable this process. If you want to invest in the stock market, you can do so by showing the aadhaar card as the accepted proof for address as well as identity at the Securities and Exchange Board of India.